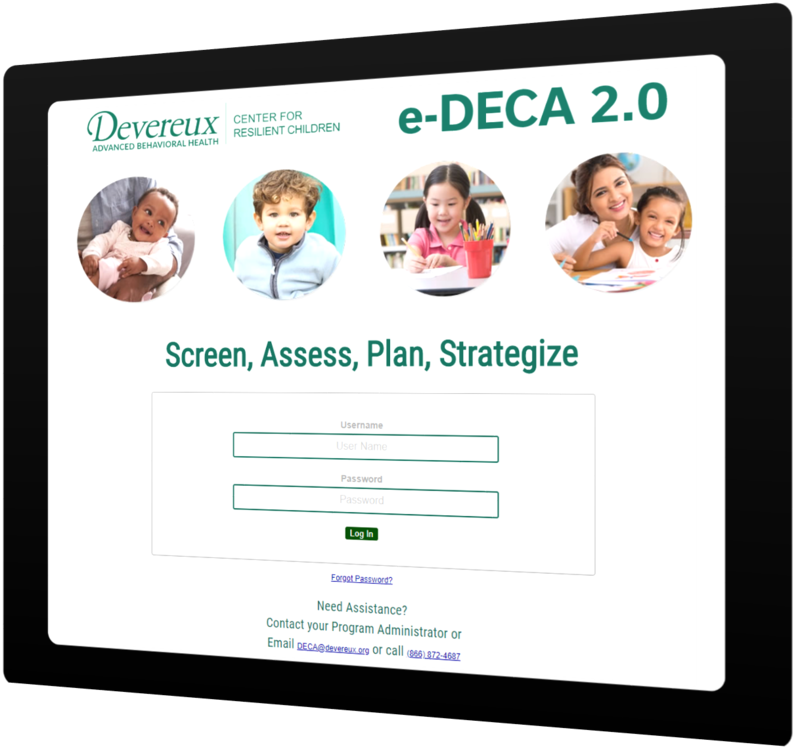 You can now administer the nationally standardized, reliable and valid Devereux Early Childhood Assessment (DECA) ONLINE for infants, toddlers, preschoolers and clinical! This web-based application allows for both teacher and parent ratings to be entered online, it completes all scoring, generates reports, provides strategies for both school and home settings, and stores your data in a secure database. Get started with the e-DECA in order to promote resilience and social-emotional health in young children and in the adults who care for them! Want to learn about the Conscious Discipline version of our e-DECA System? Click here! Please contact [email protected] if you have specific questions. We offer Data Analysis Services to our e-DECA users! Let us help you get the most out of your e-DECA data! Click here to learn more. Want to get started with e-DECA 2.0? Teachers’ protective factors matter too. The e-DECA now allows teachers to complete the Devereux Adult Resilience Survey (DARS) within the e-DECA system. Learn more about our commitment to adult resilience here, download a PDF of the DARS here, or watch this one-minute video on how to access the DARS on e-DECA. The e-DECA can now help teachers see and understand the connections between the e-DECA strategies and how they support the goals of the Head Start Learning Outcomes Framework. For each e-DECA strategy, a PDF that explains the alignment is available to view/download. This new enhancement helps teachers see the endless opportunities available to promote children’s social emotional health and resilience while implementing goals from the Head Start Framework. *Please note that this enhancement is not available for e-DECA Conscious Discipline users. The Devereux Center for Resilient Children’s model includes assessing AND promoting children’s protective factors. Research-based strategies are linked directly to a child’s assessment results and can be used in both the classroom and home settings to strengthen any areas of need that are identified by the assessment results. e-DECA users will find a comprehensive list of research-based strategies that are specifically targeted to strengthening Attachment/Relationships, Self-Regulation, and Initiative. Strategies to reduce behavioral concerns are also available on the e-DECA. Watch this video on how to access strategies, or see a sample strategy report here. Spanish Strategies now available for e-DECA! DCRC and Kaplan are proud to announce this great enhancement to the e-DECA system! View the video below to walk through how you can access strategies and print reports for Spanish-speaking families. View this video to see the process. Yet another great enhancement to the e-DECA system, the Devereux Reflective Checklist! Young children’s behavior is affected by many factors, including the quality of the learning environment and the effectiveness of teaching practices. The Checklist is designed to help preschool teachers reflect on and intentionally use practices that promote social and emotional health in preschoolers. View this video to see how to access this valuable tool.